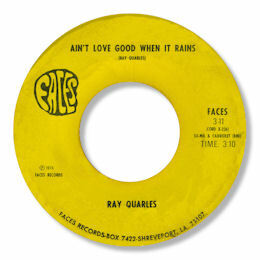 I don’t know of a poor release on the tiny Faces label out of Shreveport LA but the rarest may just be this double sided beauty from Ray Quarles. “It’s Gonna Be All Over” is a tasty mid paced item with a very good chord structure and some fine high baritone voaclas from Quarles. But Ain’t Love Good When It Rains, also penned by the singer, is even better to my ears. He puts more effort into the lyric, grittier and with the occasional falsetto whoop, and the horns and background singers add considerably to the mix.